Clone Aerial Troopers, or Jet Troopers are specialized Clone Troopers whose armour is attatched to wings and rockets which the troopers can operate while airborne. 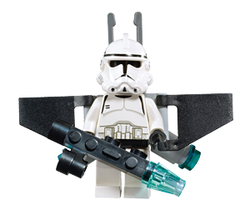 Clone Aerial Troopers are the same exact minifigure as normal Phase II clone troopers. The only real difference between the two are the jetpack additions on their back. The helmet is large and mainly white, with a T-shaped slit that reveals the black head underneath. At the bottom rim of The helmet, on both sides, are cylindrical shapes that bulge out. These tubes run from the front of the helmet to the back. Five small, vertical, black lines mark each one, as do black dots at the tips, representing the breathe filters. The torso has printing on both sides, but none on the arms or legs. The arms are white with black hands and the legs are white with black hips. The front has printing of armour that covers, the chest. Two horizontal and parallel lines are located on the right side. Below that is the armour that covers the stomach and then the utility belt, which has printing of blaster cartridges and other packets. The back, although mostly concealed by the jetpack, continues the armour printing. In the centre is a rectangular plate that, as depicted by the shadow printing underneath and to the sides of it, is meant to have the appearance of jutting out slightly. Below that is a horizontal cylinder that represents the thermal detonator all troopers carry. The trooper carries a large gun with a transparent light blue tip. This represents the EMP (Electromagnetic Pulse) Blasters jet troopers carry. The jetpack consists of twelve pieces. One is connected to the neck part of the minifigure and travels down the centre of the back. Another, larger piece connects to this one. The two black wings connect to the sides of the second piece while two smaller parts are located in the centre. On the centre parts, two pieces traditionally used for harpoons are placed, with the tips ending above the head and the handles at the level of the legs. The handles are angle outward slightly and tubular pieces ending in transparent blue studs are placed on each one. 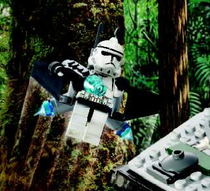 Clone Aerial Troopers were deployed on planets with harsh or rough terrain and heavy resistance. They were elite troopers trained to a higher degree than normal clones and used better quality and more high-tech weapons, such as the DC-17 Blaster Pistol and the EMP Launcher. Their jetpacks could keep them airborne for a sustained period of time and allowed them great maneuverability in the air. Their agility was also due to their extensive training. The jetpacks normally were armed with a rocket or warhead to be fired in times of need. The jetpacks and the troopers that used them were made famous by Commander Cody of the 7th Sky Corps, who often used them. Aerial Troopers were later succeeded by the Jump Troopers of the Galactic Empire. Facts about "Clone Aerial Trooper"
This page was last edited on 9 January 2016, at 20:36.